They're back. Philo Beddoe, the easygoing truck driver and bare-knuckle brawler, and his 165-pound orangutan friend Clyde get into more mischief in this faster and funnier sequel to Every Which Way But Loose. 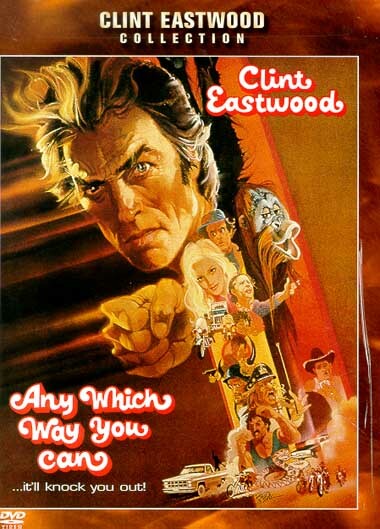 Clint Eastwood stars again as Philo, now thinking he'll "retire" from fighting. But a new contender lures him back- and mobsters kidnap Philo's girl (Sondra Locke) to ensure he'll turn up for the showdown. Ruth Gordon as Ma, Geofrrey Lewis as Orville and those hapless motorcycle morons called the Black Widows all return in fine form. Songs by Glen Campbell, Jim Stafford and Snuff Garrett make up a tuneful country score, including an Eastwood/Ray Charles duet on "Beers to You." As ever, Clyde steals the show, particularly in a courtship scene with the lady orangutan of his dreams. Any Which Way You Can, and you'll be entertained.